New Zealand deer are raised in spectacular surroundings with fresh-flowing rivers, abundant pastures and ample sunshine, where farming practices are clean and free of hormones. The high level of attention to detail in breeding and farm management emphasis the importance of selection for improving meat yield and quality. In this environment lean and tender venison is created. Wilkins Farming Co (originally known as Sharrow Farm) has been breeding deer for over five decades. Initially supplying large numbers of hinds in the pioneering days of deer farming for large deer farming corporations as well as smaller South Island based operations. Deer breeding has spanned over five decades now with Wilkins Farming breeding for velvet and body weight from various European bloodlines. Bloodlines that were sourced from Rob Brookes, Ladyson, England in the 1980’s and 1990’s were based mainly on King Richard from Festl bloodlines in Germany. These German genetics have been crossed with Hungarian bloodlines at Wilkins Farming Co with a stag by the name of Fredrich – you will see he features in a lot of our European pedigrees. King Richard was a recognised champion sire. There seems to have been a universal agreement on the merit of this stag that has produced hard antler weights up to 14.2kgs with his body weight around 320kgs in his prime. King Richard’s temperament was outstanding. Along with these German genetics we have been crossed Hungarian blood at Wilkins Farming with a son of Kapos called Fredrich whose velvet and body weights speak for themselves and the progeny he left were certainly eye catching. Fredrich has been mated to selective hinds since being at Wilkins Farming, from various well-known bloodlines from German, Hungarian, Danish, Furzeland to Woburn & Warham. As well as cross breeding we have maintained some pure German and Eastern bloodlines. 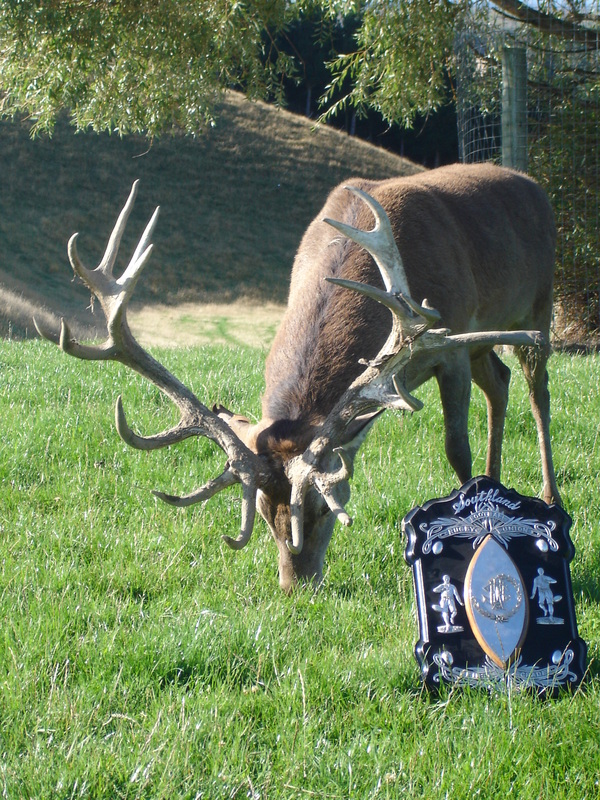 In 2008 we purchased the Stanfield Eastern stud, this stud was owned and managed by Clive and Elsie Jermy who pioneered the importation of Eastern European deer to New Zealand. Adding further depth to our herd we purchased Peter and Yvonne Doncaster’s hind base in 2012. Since 2001 artificial insemination (AI) has been a big part of introducing new genetics to our herd. The use of AI enables us to get larger numbers of progeny on the ground by the same stag therefore giving the stag purchaser more selection as well as improving accuracies within our herd. The introduction of the above herds as well as our AI programme reiterates our commitment and depth of breeding within our herd. OUR AIM IS TO PRODUCE A HIGH VALUE ANIMAL FROM AN EFFICIENT MATERNAL WEIGHT HIND USING THE LATEST TECHNOLOGY AND BEST GENETICS AVAILABLE. Through recording it is easier to mate the right hind to the right stag for specific goals. We are currently establishing Breed values and DNA profiles of our animals to enhance the accuracy of our monitoring. Our main focus is breeding an animal that will be an efficient breeder of venison. To do this you need to have the right genetics and feed. The genetics we source, we believe are the best available in the world that we can access for the specific traits we are breeding for. 2. High carcass yield as well as high value meat cuts providing a higher value breeding animal. 3. Temperament, fertility and calving date all play a part in a successful breeding programme. 4. A strong velvet and trophy genetic base also means these stags will perform well beyond the venison market. A priority remains breeding for velvet and safari.